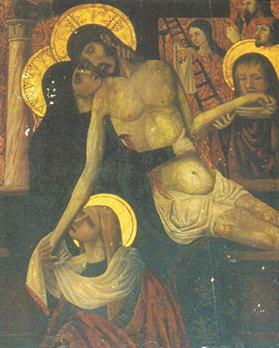 Lamentation for Christ, tempera on panel. One of the few existing medieval retables in Malta is a dismembered pala d’altare at the Qormi parish church of St George that dates to approximately the middle of the 15th century. This retable’s four component parts are, however, still extant and preserved in the parish church and museum. The central large panel, depicting the Lamentation for Christ, also known as The Pietà/Our Lady of Sorrows, was flanked by two side panels showing St George and St Gregory and topped by a wooden painted crucifix. Nowadays, the central panel is the altarpiece of a side-altar, the crucifix overlooks the choir altar while the other two panels form part of the collection within the parish museum. This pala d’altare was the titular painting of the parish church from mid-15th century to 1632 when it was replaced by a new titular painting of St George overcoming the dragon as depicted by Gaspare Formica. Very probably, it found its way to Qormi when the parish church (not the present edifice) was rebuilt or was extensively enlarged in 1456 during the rectorship of Don Giglio Lombardo. It was the time when the central part of a parish’s titular retable represented Our Lady with the actual titular saint depicted on one of its flanks. That this central panel represented The Pietà is significant when noting what was happening on the European mainland. In Europe, extensive propagation of this aspect of Mariology dates from the 13th century onwards, and the earliest recorded feast of The Pietà harks back to 1423. Stylistically, the Qormi painting can be securely attributed to only about three or four decades after this date and this makes it the oldest extant depiction of The Pietà on the island. That a crucifix topped the central panel and that a side panel depicted St George is understandable but it’s anybody’s guess why St Gregory is featured on the other side since it does not seem that there was any particular devotion to this saint in the parish. However, retables were not necessarily the work of one single artist and shifts in cultic devotions could result in the substitution of panels. The style and technical evidence of the panels and the crucifix point to a Sicilian workshop active in the first half of the 15th century that, however, combined a number of artistic influences – Early Renaissance, Inter­national Gothic and Byzantine traditions. Painted crucifix from the Lamentationfor Christ retable. The central pa­nel shows the sorowing Virgin holding the dead Christ in her lap and accompanied by Mary Magdalene and St John the Evangelist with Nicodemus, Joseph of Arimathea and Veronica in the background together with a number of Passion emblems. The poignancy depicted in the painting is Byzantinesque, but the artist also shows knowledge of International Gothic and an awareness of Flemish art. 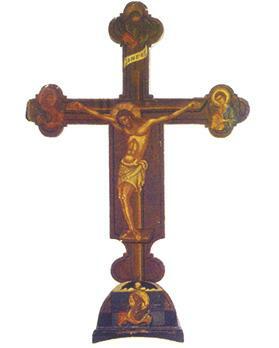 The crucifix belongs to the Italian Gothic tradition and was presumably one of a number of similar crosses in Malta but the only one to have seemingly survived locally, though many such crucifixes are still extant in European churches and museums. The two side panels are contemporaneous to the central panel but probably by the hand of a different painter and, possibly, through another workshop in Sicily. St George is shown in well-rendered full medieval armour (and not in Roman garb) on a prancing horse battling the dragon, while the princess prays for his victory. In the other panel, St Gregory is depicted in full pontifical regalia and having a saint in the background, which is popularly said to be St Venera. Both are in a completely International Gothic idiom. Unfortunately, the paintings have suffered not only from the ravages of time but also from over-painting, abrasion and inept restoration in the past, with the last intervention being by Lazzaro Pisani in 1919-20. 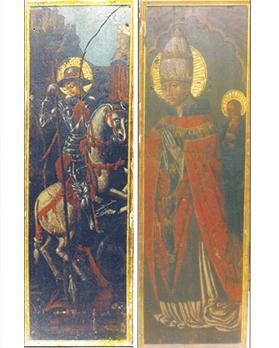 The central painting, tempera on panel, has been heavily retouched with oils; certain areas (including the sky) of the St George panel have been heavily repainted while the pontifical cope of St Gregory is a later addition. A proper, professional restoration of all the four components is a desideratum. St George, side-panel from the Lamentation for Christ retable. Right: St Gregory, side-panel from the Lamentation for Christ retable. After restoration, ideally, the four components would be brought together once again, just as they had existed in medieval times up till c.1651 when the retable was dismembered. The parish wishes and is willing to undertake this project but lacks the financial resources to ensure that the panels are brought back to their former pristine condition and glory. Being one of the oldest retables in the Maltese islands, this pala d’altare is actually part and parcel of the Maltese national heritage and certainly worthy of preservation. It is earnestly hoped that public-spirited, generous individuals and institutions that value Maltese artistic heritage will readily contribute to such a worthy cause. The respected Professor of History of Art Mario Buhagiar, who has written at least four times about this retable in his publications, has categorically declared that this pala d’altare deserves “to be counted among Malta’s finest Late Medieval paintings”, and continues by stating that the crucifix “deserves much better recognition as one of the masterpieces of Late Medieval art surviving in Malta”. Dr Joseph F. Grima is a historian, a member of the Qormi Good Friday Committee and was formerly Hon. Secretary of The Malta Historical Society. The author wishes to thank Prof. Mario Buhagiar for his assistance.